Last week I had the honor of presenting to the NJ Mobile Meetup group. 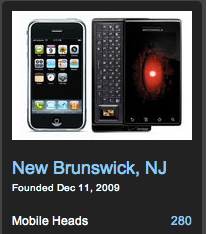 NJ Mobile is a collection of about 300 mobile technology enthusiasts that I co-organize. While I’ve been one of the groups organizers for quite some time, this was the first time that I actually spoke at an event. Much to my delight the presentation, which was partially based on my blog post The Rules of Mobile App Design, was very well-received.